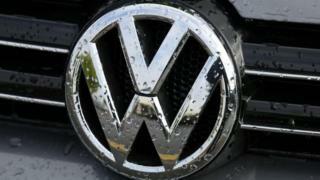 Volkswagen is facing €8.2bn ($9.1bn; £7bn) in damages claims from 1,400 German investors over its emissions scandal, a state court has said. The regional court in Braunschweig near VW's Wolfsburg headquarters said it received 750 lawsuits on Monday alone. A year ago, an investigation in the US found that VW had cheated emissions tests for diesel cars by using special software. VW faces a flood of actions and has set aside €16.2bn to cover the lawsuits. The court said it brought in extra staff to process the claims submitted by shareholders, who were concerned that 18 September, the day VW's manipulations were uncovered a year ago, may be the deadline to file. It said most of the cases were bundled actions containing claims from multiple plaintiffs, in many cases private investors. The scandal broke after an investigation found that many Volkswagen cars being sold in America had software in diesel engines that could detect when they were being tested. The so-called "defeat device" changed the performance of the engines accordingly to improve results. The German car giant admitted cheating emissions tests in the US and this summer agreed to pay $10.2bn to settle some of its US claims. Earlier this month, Australia launched legal action against the carmaker and last week asset manager Blackrock and a group of institutional shareholders said they would sue VW for €2bn. The German states of Hesse and Baden-Wuerttemberg have said they will also take legal action. The claims relate to the drop in Volkswagen's share price after the scandal broke. Hesse finance minister Thomas Schaefer said the fall in VW's share price had cost the state about €3.9m. Earlier this month, a VW engineer pleaded guilty to involvement in the scandal. James Liang, a German national, pleaded guilty to violation of the clean air act, a wire fraud count and a consumer fraud count and became the first to be charged as part of the US Justice Department's year-long criminal probe into the firm's rigging of federal air-pollution tests. He could face five years in prison, although by co-operating with the US federal government he could reduce his jail time. His trial will be held in January.